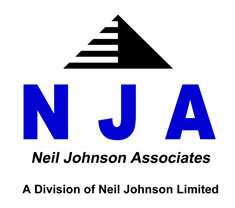 the founder and principal of the practice, is Chairman and Managing Director of Neil Johnson Limited. Educated at Bedford Modern School and the City University, London, he graduated in 1976 with a First Class Honours Degree in Civil Engineering, which included approved integrated professional training under a Local Authority sponsorship. Subsequently he returned to Local Government where he attained the position of Senior Engineer and became experienced in the design, detail and site supervision of road construction, drainage and bridgeworks, in addition to structural design and the preparation of planning reports. Thereafter he moved into private practice where he acquired experience of most structural materials on projects including multi-storey office blocks, factories, warehouses and housing developments together with associated site investigations. More specialised experience was obtained as a registered certifier of timber framed housing for the National House-Building Council, as an approved inspector for PRC Homes Limited and as an expert witness in the High Court. Having risen to the position of Associate he was entrusted with the responsibility for the establishment and management of a new branch office where he remained for three years until the formation of his own practice, Neil Johnson Associates. A Corporate Member of two Engineering Institutions he served for a number of years on the Local Branch Committee of the Institution of Structural Engineers, initially as Graduate and Student Representative, and thereafter as a Full Member. He is also a Member of the Chartered Management Institute and a Fellow of the Faculty of Building. For over twenty years he was a Member, and three times President, of the Rotary Club of Kempston for which he was awarded the prestigious Paul Harris Fellowship.